We welcome you to tour this beautiful home this weekend! Join REALTOR® Kathleen Sainato at her open house at 646 Raab St. Pickerington OH 43147 on Saturday 4/13 and Sunday 4/14 from 12 pm – 3 pm. New construction in beautiful Preston Trails. 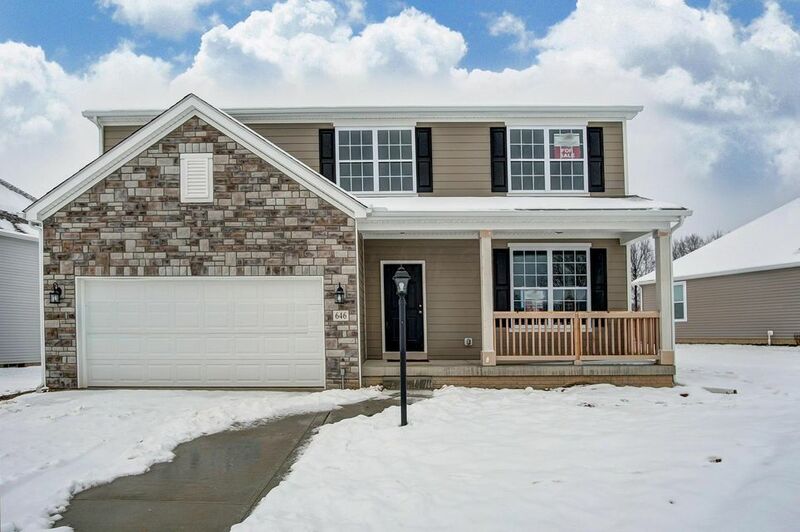 This traditional 3 bed 2.5 bath home has many modern features that create the perfect combo. When the weathers nice relax on the over sized front porch, when it’s too chilly kick back next to your fireplace in the great rm. This home includes exp 9 ft ceilings to add to the overall open feel. Multiple spaces for hanging out or entertaining including a huge great rm, living rm/den area and a loft upstairs. The kit includes upgraded counter tops, staggered cabs and a kit island & SS appliances. The owner’s suite w/a coffered ceiling will knock your socks off! Enjoy the spa like bath with a soaking tub, W/I shower and TWO W/I closets! Laundry is upstairs for convenience along with another full bath and linen closet. Basement and 2 car garage for extra storage!